a) don’t wear all of and maybe even forgot you had some pieces? b) have stored away in a place where it gets tangled? c) want to show off on your body and in your home? I fit all of the above. I had multiple jewelry boxes and storage centers for various items. A small tin full of bracelets and a pretty box full of tangled necklaces were on display. I also stored a few jewelry boxes full of sentimental or jewelry from my adolescence when everyone gave me necklaces. (I’m the only niece/only granddaughter on my mom’s side.) A lot of these were sold on consignment, due to no longer fitting my neck or just the fact that I just didn’t love them anymore. A few were real gold or silver and I sold those at a jewelry store. I had a TON tested – it was pretty embarrassing, I had a lot of other metals that the jewelry lady didn’t care about; but she handled it very nicely. My earring collection was ridiculous. I have 5 piercings in my ears and I love to accessorize with earrings – however, my ears are extremely sensitive. I had a few earring trees over the years, but they weren’t great at holding stud earrings. What I did have, and had forgotten about: a GIANT cork bulletin board. It used to hold photos, notes, and postcards which had been attached with tape, so it was a mess! AS FOR EARRINGS – I did a major overhaul of these, too. I justified keeping many, many pairs for a very long time because “If I just wear them for a few hours, my ears only itch a little.” Not anymore! I still have some that I can wear for a day or a night out and then remove them – if it ever gets to be a shorter amount of time or I don’t love them anymore, they’ll go. 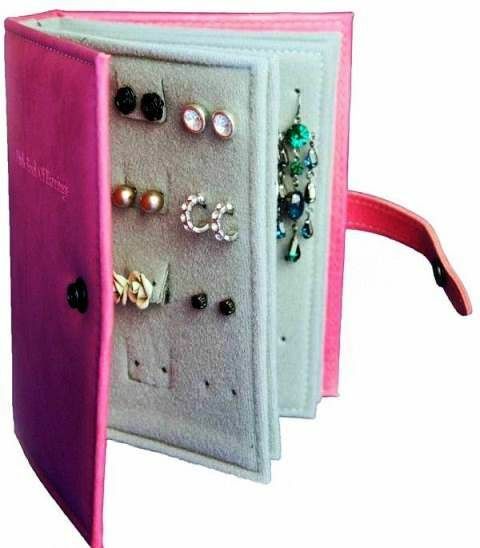 For this I created an earring book. I bought way too much pink felt, cut it into squares, and stitched the “pages” together like a book! The earrings go right through, and are organized in such a way that it’s easy for me to find what I need. 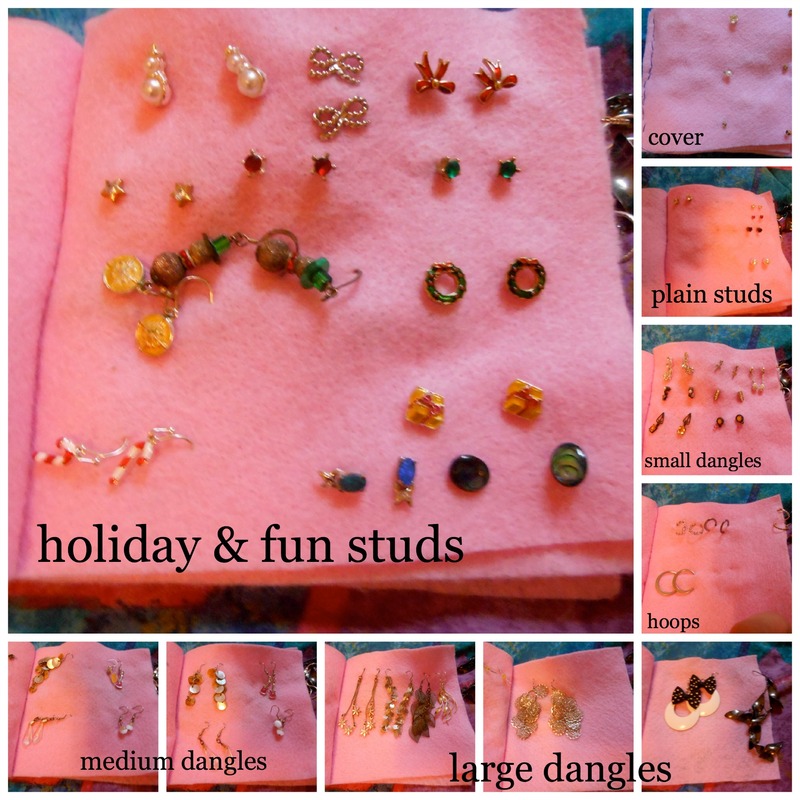 Note the large amount of holiday earrings – a gift one year, and I’ve kept most as I work in an elementary school! This was so helpful that I’ve bought more jewelry items since making this – and wear them – OR I pass up buying jewelry that I don’t think I’ll REALLY wear. Cork boards can be pretty inexpensive and easy to hang. Felt was easy to find and buy (pretty sure I found that felt at Walmart) and I hand-stitched the edge. This entry was posted in Cleaning, Declutter, Organization and tagged cleaning, consignment, cork board, declutter, DIY, earring book, jewelry organization, necklace organization, organization, organize. Bookmark the permalink.